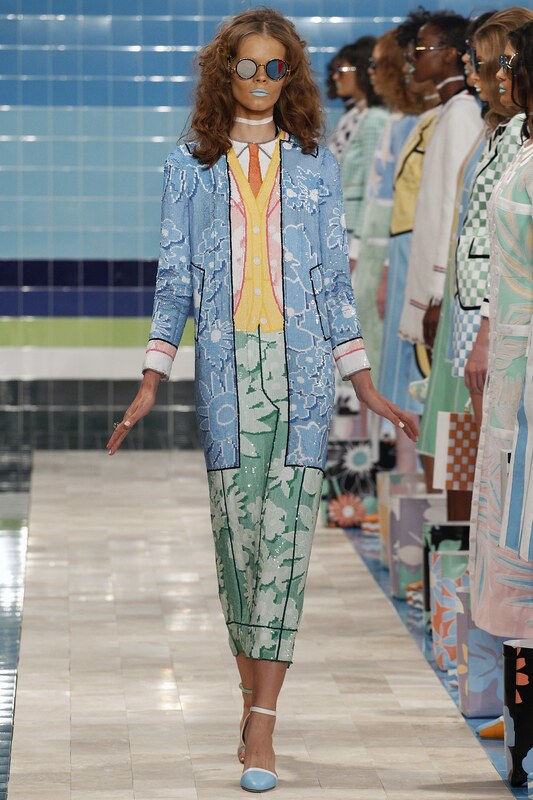 Nothing excites me more than trompe l’oeil which Thom Browne took to a whole new level for his RTW Spring collection. 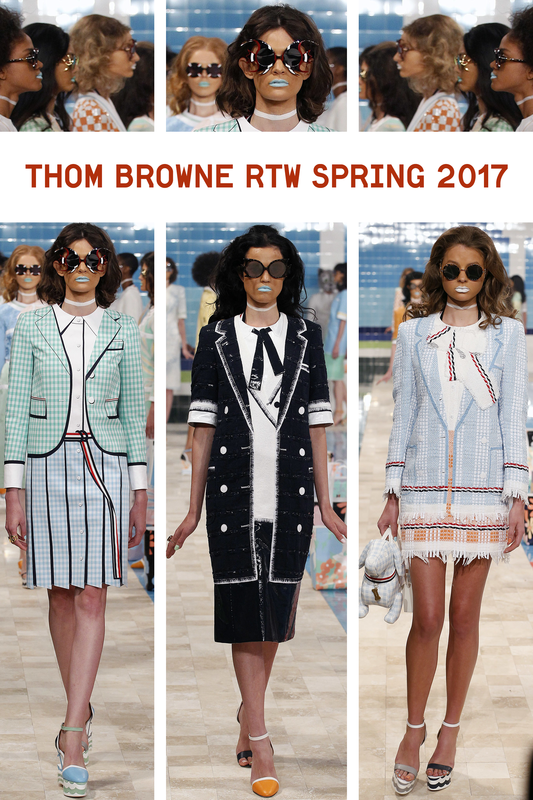 Mixing various prints with texture, Browne’s models’ seemed to exude confidence with contempt, wearing nothing but sweet concoctions of pastels with the occasional doses of black + white thrown in like nonpareils inside a candy bag. 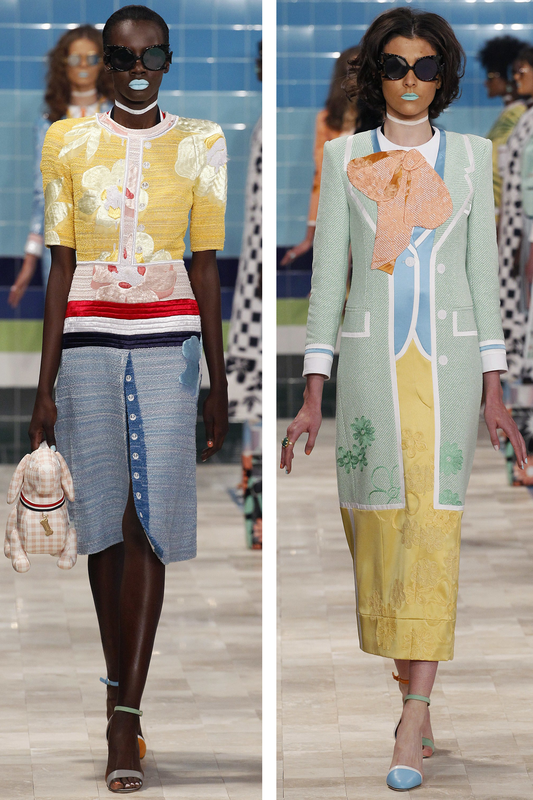 The models appeared to be socialites out for a stroll when in fact they were really out for a dip at a pool party Thom Browne style, with the wavy patterns on the shoe platforms mimicking water. 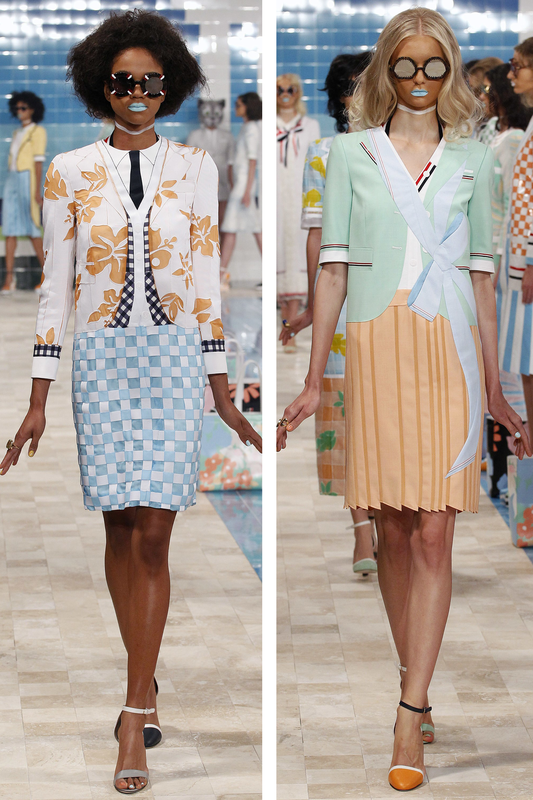 One by one, VOGUE RUNWAY reported how the models were said to first appear in bubble coats, complete with floral swim caps, only to be removed, revealing all of Browne’s genius dresses seen here. But these were not your ordinary dresses. Trompe l’oeil was the big draw here + by big I mean big! Sure you had your typical faux bows, faux buttons et al, but these pieces had something different about them. These dresses sometimes looked like a two-piece ensemble, if not, one with three pieces, complete with vest. Tricking the eye, look after look, simply became one refreshing statement after another. In one occasion, a model came out wearing what appeared to be a long sweater over a short jacket + vest over a white shirt, complete with orange tie, with blue floral wide leg trousers, when in fact it was all part of one maxi dress made to shimmer with clear sequins (bottom, center). Embroideries played a major role throughout the collection, at times with thread darker if not the same color as the fabric it laid on, whereas other times, they outlined florals in contrasting colors to their backgrounds. Browne’s treatment of buttons turned them into embellishments, as they served no function but rather played their ‘role’ as they lined up with their button holes (below, rt). 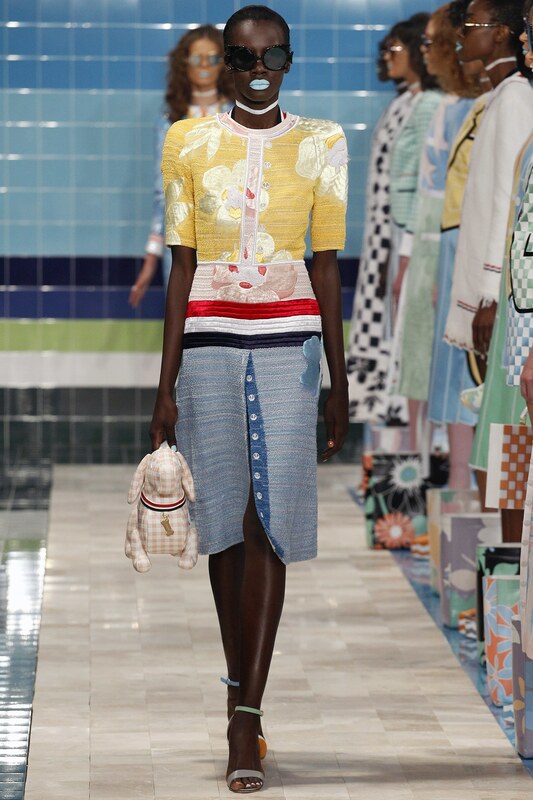 The many textures at play here included weave patterns + bouclés, set to dazzle with amusement only to further enhance the whimsy of different colored shoes worn with every look. Of course, with the assistance of a long back zipper, similar to that of a wetsuit behind every dress, with one pull down, the whole garment came off, to reveal red, blue + white swimsuits worn underneath. Even the pastel blue lips + mismatched pastel mani-pedis still managed to maintain the models’ socialite polish, after all, was said + done. In one word, the whole collection was flawless.